You are here: Home / On Board / Great Things are Happening in 2019! As we look ahead into 2019, we want to share some of the exciting projects and events that will fill the ABO calendar in the coming months. First up is the website, www.americanboardofoptometry.org. Some of you may have already noticed a change to the login screen. There are now two separate login areas, one for Diplomates and one for Non-Diplomates. 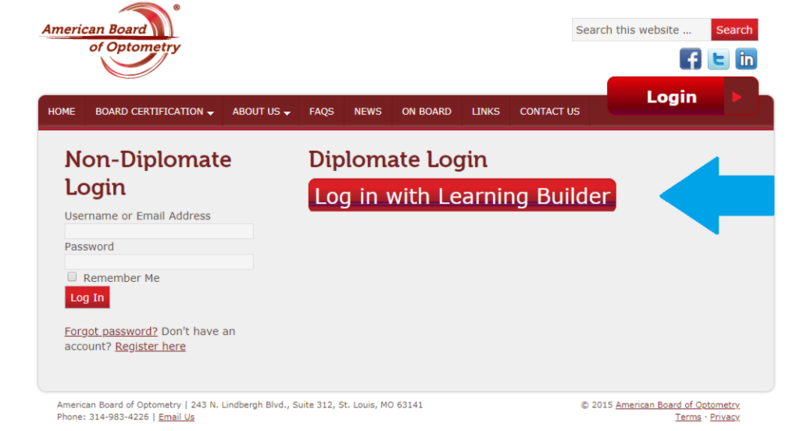 As a Diplomate, make sure you are using the correct login area by clicking on the “Log in with Learning Builder” button. Non-Diplomates who want access to purchase webinars will use the Non-Diplomate login area. Additional changes may be made over the next several months as we work our way through a planned redesign of the website that is scheduled to launch near the end of 2019. The new website will feature a fresh design, simpler navigation and updated resources. Our webinar series continues into 2019 with a great lineup of speakers. Beginning this year all webinars are COPE-approved and can be attended as a live event or watched as a recorded webinar for up to three years. The first webinar of 2019 was held on January 29th and featured Dr. Paul Ajamian speaking on the topic Avoiding Malpractice. It is now available in recorded format on the ABO website. To receive COPE credit, a passing score of 70% must be achieved on the 20-question quiz offered at the end of each webinar. Next up in our webinar series are two great speakers that you do not want to miss so mark your calendars now! Monday, April 8th Dr. Susan Resnick will present Contemporary Dry Eye Management. Dr. Resnick is a leading expert in dry eye and scleral contact lenses and is a frequent author, lecturer and consultant in the areas of specialty contact lenses and emerging vision and eye care technologies. Tuesday, August 6th Dr. Kathleen Elliott will present Pediatric Ocular Emergencies. Dr. Elliott is a professor at NSU College of Optometry and lectures on various topics including ocular disease and surgical management in pediatrics, aesthetics and practice management. She completed a two-year Pediatric Optometry Fellowship in Tulsa, Oklahoma and was named Oklahoma Optometrist of the year in 2014. And finally, toward the end of 2019, a survey will be sent to all CAP participants to gather feedback on the first 12 months of our new continuous assessment program. We look forward to all our projects and events in the coming year and will make it a priority to keep our Diplomates updated as we go!